I am blessed to know many truly talented and generous bloggers who consistently give to others – as Donna Fontenot so aptly put it – “just because”: Because we can. Because we don’t want other bloggers to have to learn everything the hard way. Because we know that sharing our experience and what we’ve learned over the years will benefit many. 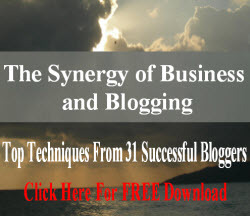 In her call for submissions she hoped for twenty bloggers to participate; the 1st Edition of The Synergy of Business and Blogging: Top Techniques from 31 Successful Bloggers features the hand-selected best content from 31 expert bloggers. This ebook includes posts from many of our favorite bloggers including ebusiness coach Donna Fontenot, Kimberly Castleberry who shares Social Media Marketing tips as @AskKim, Dennis Edell who writes about Making Money Online, Andrew Rondeau of Income Blogging Guide fame and everyone’s favorite Social Media blogger Kristi Hines aka @kikolani. The book contains what I consider the most important post I ever wrote: Are You Playing Hide and Seek with Your Market on how to figure out who your target audience is and choose the keyword phrases they would use to find you. It includes tools for keyword research and how to track your progress in the search engines. When you get your ebook be sure to click through and visit the sites of those whose advice you found worthwhile. Every one of them would love to hear from you. Nice to see all of this excellent information. I was thinking about blogging on our website and this has been really useful information. I wasn’t sure if it would help get people to my website. Thanks. Awesome tips for running new business, I really appreciate to you about this blog. Since finding this great blog I’ve been overwhelmed with information. Your blog lead me to Kristi’s blog and Ileane’s blog and so on. There is just too much to read, I think I’ve learned a lot, but I have been less productive lately. Too much to read, Too much to figure out. This book will be put in the information que. Thanks Gail! DAMN! Perfect blog post, especially when looking at building a business blog ourselves. Although, would you happen to know of any more business blog tips like this? This blog is full of free information on building a business blog and also on deciding whether it is best to do it yourself or hire someone with experience. When your business may not need to install your own site and what to focus on if you do. Would a Small Business Online Profile work better for you? Small Business Internet Marketing Priorities. You can also learn a lot from reading our Hire GrowMap information because it details what we recommend businesses focus on. We are just getting ready to start a blog as a part of our website, so this was very helpful information. And I really enjoyed reading your playing hide and seek with your target market post. I can see why you consider it your most important. Thanks for all the info! Check out my reply to the comment just above yours for more posts you’ll want to read about what to focus on when creating your Internet presence. This blogging information is amazing. How cool is it to get all this info in one download. I’ve wanted to do more blogging for my biz and hopefully this will help. Thanks! Such great information on your blog about blogging. Been reading quite a lot on here and maybe I’ll get the download. Just wanted to say thanks for the useful info! You’ll also want to be sure to get your free listings on Local Search Directories and read my post about Small Business Internet Marketing priorities. Wow! thanks for such a useful download – and no strings! Can’t wait to read it. I’ve been blogging some over the years, but I bet there’s a lot of good info, maybe it can help me to take things a little more seriously. I often visit Dennis Edell and it is one of my reading reference. Thanks very much for the free ebook download and the all hard work that went into it, now I’ve got 101 pages of content to work my way through and keep myself busy. This is definitely THE book to watch out for! It would be an inspiring read as experiences and information are shared by successful and eminent bloggers on how to maximize your blog to make money online. Wow, thanks a lot for sharing this. I’m really looking forward to reading everything in this e-book. 101 pages of great content, yay! This looks like the Bible of blogging, with so many reliable bloggers included… very nice. I’ll start reading one of these days when I’m done with all this stress, thanks a lot again. Have a great day, Maria. This seems to be a great reference book for guys like me who want to know the intricacies of blogging, SEO and money making through blogging. Articles from experts who have seen these pinnacles in their career front share their thoughts and guidance. This book is a definite must-have. Hi Ann Karen and welcome to GrowMap. You might be particularly interested in the post I’ll share in CommentLuv. BTW Since you asked me to collaborate with spreading the commentluv word around, have had several opportunities to do so. Really pleased whenIcan give back to this amazing community I am now so much a part of. Also been able to help some newbies with networking too. Thank you for being proactive about recruiting bloggers to grow your niche CommentLuv community. Looks my night would be busy with it. I won’t be miss this opportunity. Downloaded and thanks. All the bloggers in that book love collaborating so don’t hesitate to connect with any of us. The more the merrier (and the greater the reach and influence!). Nice tips and tricks share which can help people to make money from blogging. I like this interesting and informative blog. Have you seen my massive post on logo design? growmap would love you to read ..How Much is a Memorable Logo Worth? I just came back to tell those who haven’t downloaded this ebook to download it right away. I went through the whole thing quickly to get a feel for it and its a gold mine. There are so many things i there that most of us think we know but the reality is we don’t know! I am not making this up but this is by far the best ebook I have ever gotten about blogging and related matters. Thank you to all the bloggers who took time to add value to this ebook. Thank you so much for taking the time to come back by and comment. I left a comment in your blog because I really want to share your content but almost never share or link to any post that has a giant block of AdSense ads between the title and the blog post. I explained why in my post How Not to Monetize Your Blog. Thanks for the download. This is indeed a wonderful read and I will be sure to recommend it to all my friends and business associates. Very creative idea! The Synergy of Business and Blogging – this book is the best I think for us bloggers who are just starting out exploring the blogosphere. Have tried buying a book -or shall I say an Ebook – but I don’t know how it was done actually, for my friend made the deal. If only I have the idea on how buy these Ebooks., then I’ve got a lot of books to buy..Much more if it is a business related e-book. Spreading the word about this book you took the time to create is my pleasure. The more bloggers and small business owners who want to blog for their businesses who see it the better. I downloaded this ebook from an other blog. This ebook is getting quite a buzz around it. Unfortunately, I didn’t had time to read it yet, but getting so much attention definitely pushed it up on my things to do! I am pretty sure it will take a while to read, 100+ pages aren’t all that easy on the eyes and mind. All I can say is thank you to all those that contributed to the ebook and agreed to let it be distributed for free and to all those that promote it! With the bloggers who participated all spreading the word it isn’t surprising that the ebook is getting plenty of visibility. I haven’t managed to read it all yet either – too many other commitments – but I will. My first time to your site, but luckily I found another great introduction here, Michele Welch. Michele’s book sounds awesome, everyone is in love with it. I am getting excited to read it too. I am happy for you all and the book. Welcome to GrowMap. I love to mention awesome bloggers here and regularly link to them, recommend them and compile Follow Friday lists of them. Now that there are so many who have been writing about Blogging Tips, Social Media and Marketing I expect many will start branching out into specific geo-targeted niches. Few times in life do you get something good for free…i really needs some blogging tips…i am totally downloading it. I hope you really do. This is one of several ebook projects that bloggers have rolled out to assist other bloggers and small businesses learn what they had to figure out the hard way. This is fantastic eBook with lots of great advice and tips. A must read for any business that bloggs or is thinking about it. Thanks for offering it free. The great thing about the bloggers featured in this book is that they are willing to answer questions and assist others so if what you read raises questions just pop into their blogs and ask. Any time someone has a question and isn’t sure who to ask I encourage them to connect with me. I spend much of my time staying on top of who knows what and who has the most comprehensive, current information about any subject related to promoting businesses and blogs. Wow! This is like a gift. E-book which contain the experience of 31 Bloggers…. Amazing. I have downloaded it and will read it thoroughly. Keep me in mind if you know people in India who have online skills, ideally someone who I can collaborate with and teach specific skills (if they don’t already possess them) and then have them manage and train others. Every person who desires to work deserves to be able to have a roof over their head and food on the table regardless of where they live. There is plenty of work (and money, food, resources) to go around when we take control away from the greedy few and give it to the generous many. The statistics in the second half of the post I’ll share in CommentLuv in this reply clearly show what the problems with all countries’ economies are and what we can collectively do to improve them. I’m really looking forward to reading this, hopefully it’ll also tell me why my “last posts” are not being picked up by commentluv amongst the raft of great information! I don’t recall there being anything in there about CommentLuv but read the post How CommentLuv Works which should. I find it challenging to locate answers on the ComLuv site so I did a compilation post last year that links to the posts I regularly use or recommend for reference. See CommentLuv Help which also has links to videos and resolutions for common issues. Thanks for the tips. This is very helpful for any individual who is fond of blogging. Rare are those people who shares great knowledge they had especially handing out to potential ones. Your tips are really effective and really miraculous. I really appreciate meet to it. Thanks for your support. I really like it. Thanks for your support for these tips. Wow, truly a priceless gift! Thank you very much for letting us know and thanks to all the great bloggers who contributed to this ebook. Just downloaded it and will be busy reading it for a while. Thank you. It is very important to help other bloggers. It does help when the person is willing to learn from others mistakes, though. Awesome ebook at 101 pages I think I am going to be busy for a while. Great knowledge. Your knowledge based post always attract me towards your blog.Thanks again. There are others in the works. If you want to be in the next ones be sure to let me know and connect with Michele and Murray too. Great advice from the pros, I especially follow all blog posts from Kristi Hines at kikolani.com because she writes about difficult topics in an easy to understand language that also newbies can follow. I do too! And lucky for me Kristi and I chat five days a week so we can share what we learn, great content, answer each others’ questions and more. I encourage other bloggers to connect with those in their niches and share their expertise directly too.